“Rebirth” sees the band playing with different melodic black metal elements… which make for a wonderful musical counterweight to the resonant doom n’ death rumbling of the album’s general comfort zone. 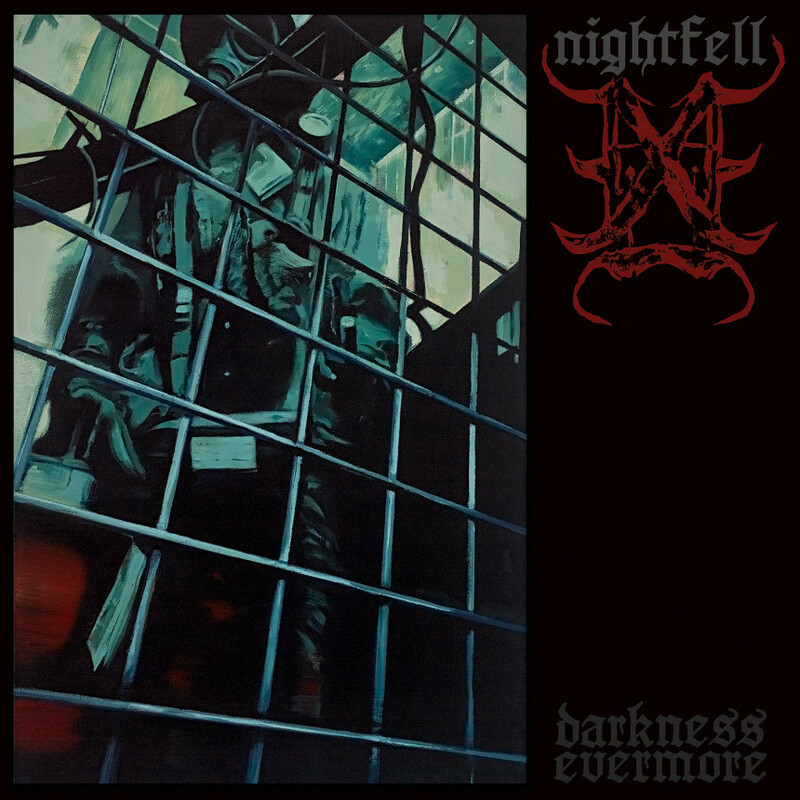 For many of us who like to fancy ourselves as paying really close attention to new metal releases, Nightfell kind of came from out of nowhere and proceeded to knock us on our asses last year. You would think that with members from bands as venerated as Tragedy, His Hero is Gone, Aldebaran, and Mournful Congregation that Nightfell would have been something people would have known about well in advance. Having snuck up on the metal-loving world or not, the important thing is the quality of their debut ‘The Living Ever Mourn’. The album finished in my top ten for the year, which should tell you all you need to know as far as how I felt about it. That album was an exercise in taking two very different backgrounds and stirring them together into something wholly different, but just as compelling as either members’ previous work. 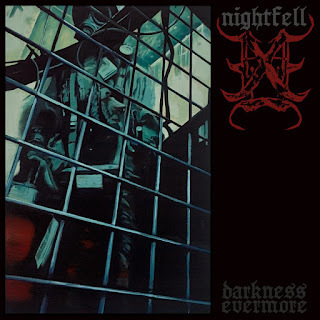 Now, not even a full year later, Nightfell are back with ‘Darkness Evermore’ and the first thing that jumps out is just how similar it sounds recording-wise to its predecessor. The guitar tone and drum sound are almost identical. While the album seems to be mastered a bit more quietly, that’s the only real difference. The immediate takeaway during early listens was that Nightfell have a very specific sound and they aren’t all that interested in experimenting with it in any drastic way for now. With that said, for as much as these albums sound the same sonically, they are by no means carbon copies musically. ‘Darkness Evermore’ begins with “At Last”; perhaps the band’s slowest to date in its early stages. The first half would fit in nicely on Paradise Lost’s recent return to form. The rest is a blend of melancholy, melodic guitar leads atop a rumbling bead of mid-paced death metal, familiar to anyone who has heard ‘Living ever Mourn’, but very much on par with the quality of the debut. Elsewhere on the album, “Cleanse” makes excellent use of the kind of higher-note chord plucking Dissection and Mayhem used to great effect in the 90s, which are woven into a song that rolls along like Nightfell’s unique spin on Entombed’s “Crawl”. “Rebirth” sees the band playing with different melodic black metal elements as well, which make for a wonderful musical counterweight to the resonant doom n’ death rumbling of the album’s general comfort zone. If there’s a knock to be made against the album, it’s my own personal disappointment that we didn’t get more of the dreary groan-singing that made “Empty Prayers” such a standout on ‘The Living Ever Mourn’. It appears briefly during “Eulogy”, which plays more like an interlude into “Collapse” than a fully realized song, but nothing that matches the brilliance of “Empty Prayers”. If I could change anything about this album, it would be to have this particular dimension of the sound Nightfell established on the debut play an equal or greater role here as well. It’s something that no one else does anywhere near as well, if anyone’s trying to do it at all. Personal preference towards that omission aside, ‘Darkness Evermore’ feels like it’s a companion album to ‘The Living Ever Mourn’ without ever coming across like an unnecessary retread. If it’s inferior at all, it’s by only the slightest of margins. If you loved the debut, as I did immensely, you’ll love ‘Darkness Evermore’ as well. ‘Darkness Evermore’ is available digitally and CD//LP here.